January is Cervical Cancer Awareness Month. No one wants to talk about cervical cancer; but we should. Because it is highly preventable and when found early, it is also one of the most treatable cancer types. More than 12,000 women in the U.S. are diagnosed with cervical cancer each year, and more than 4,000 of women die. Cervical cancer is the second most common type of cancer for women worldwide. But because it develops over time, it is also one of the most preventable types of cancer. Cancer starts when cells in the body begin to grow out of control. Cells in nearly any part of the body can become cancer, and can spread to other areas of the body. Cervical cancer starts in the cells lining the cervix—the lower part of the uterus. These cells do not suddenly change into cancer. Instead, the normal cells of the cervix first gradually develop pre-cancerous changes that turn into cancer. Although cervical cancers start from cells with pre-cancerous changes, only some will develop into cancer. It usually takes several years for cervical pre-cancer to change to cervical cancer, but it also can happen in less than a year. Cervical pre-cancers are diagnosed far more often than invasive cervical cancer. Cervical cancer was once one of the most common causes of cancer death for American women. But over the last 40 years, the cervical cancer death rate has gone down by more than 50 percent. The main reason for this change was the increased use of the Pap test. This screening procedure can find changes in the cervix before cancer develops. It can also find cervical cancer early—when it is in its most curable stage. Beginning at age 30, the preferred way to screen is with a Pap test combined with an HPV test every 5 years. This should continue until age 65. January is National Blood Donor Month and severe weather has plagued some parts of the country, resulting in the American Red Cross issuing an emergency call for blood and platelet donations. To be eligible to donate, people have to be age 17 or older (16-year-olds can donate with parental consent in some states), weigh at least 110 pounds, and be in generally good health. Donors age 18 and younger also have to meet certain height and weight requirements. Why do we need to have so much blood on hand? The Red Cross must collect nearly 14,000 blood and platelet donations every day for patients at about 2,600 hospitals and transfusion centers nationwide and once collected it takes nearly 48 hours before a donation is available for transfusion. About one in seven people entering a hospital will need blood. Accident and burn victims, heart surgery and organ transplant patients, and patients receiving treatment for leukemia, cancer or sickle cell disease may all require blood to save their lives. And in an emergency that blood supply must be available immediately. During times of severe weather, those supplies run low because blood drives are often cancelled and/or donors are unable to make it in to donate. Right now, Red Cross blood products are being distributed to hospitals faster than donations are coming in. Hectic holiday schedules contributed to about 37,000 fewer donations in November and December than what was needed. Snowstorms and severe weather have also impacted donations. Nearly 100 blood drives were forced to cancel in December, resulting in more than 3,100 blood donations going uncollected. Why are platelet donors in such high demand? Transplant and trauma patients, as well as patients undergoing open-heart surgery may require platelet transfusions. However, the majority of platelets are used by cancer patients. Platelets only have a shelf life of five days, with two days needed for testing. One pint of blood is collected from each donor. The donation is stored in iced coolers until it is transported to a Red Cross center, where it is scanned into a computer database. The blood is then spun in centrifuges to separate the transfusable components—red cells, platelets, and plasma. A dozen tests are performed on each unit of donated blood—to establish the blood type and test for infectious diseases. Units suitable for transfusion are labeled and stored. There are very specific ways in which blood types must be matched for a safe transfusion. Who discovered that there are different blood types? Dr. Karl Landsteiner first identified the major human blood groups; A, B, and O in 1901. How does my body replace the blood I donated? Why do I have to wait 56 days to donate again? Lung cancer is the leading cause of cancer death and the second most common cancer among both men and women in the U.S. It also has one of the lowest five-year survival rates of all cancer types. One reason why lung cancer is so deadly is that it is hard to find in its early stages. It may take years for the lung cancer to grow and there usually are no symptoms early on. By the time you start to notice symptoms, the cancer often has spread to other parts of the body. When a person has lung cancer, they have abnormal cells that cluster together to form a tumor. Unlike normal cells, cancer cells grow out of control, destroying the healthy tissue. These types of tumors are called malignant tumors. When the cancer cells grow too fast, they prevent organs of the body from functioning properly. There are two main types of lung cancer: small cell lung cancer and non-small cell lung cancer. A third less common type of lung cancer is called carcinoid. Small cell lung cancer is almost always associated with cigarette smoking and is usually treated with chemotherapy. Adenocarcinoma: Often found in the outer area of the lung. It develops in the cells of epithelial tissues, which line the cavities and surfaces of the body and form glands. Squamous cell carcinoma: Usually found in the center of the lung next to an air tube. Large cell carcinoma: Can occur in any part of the lung and tends to grow and spread faster than the other cancers. Lung carcinoid tumors are uncommon and tend to grow slower than other types of lung cancers. Carcinoids are very rare, slow-growing and most commonly treated with surgery. Anyone can get lung cancer. Lung cancer occurs when cells in the lung mutate or change. Various factors can cause this mutation to happen. Most often, this change in lung cells happens when people breathe in dangerous, toxic substances. Even if you were exposed to these substances many years ago, you are still at risk for lung cancer. Smoking causes about 90 percent of lung cancer cases. Tobacco smoke contains many chemicals that are known to cause lung cancer. If you still smoke, quitting smoking is the single best thing you can do for your lung health. Smokers are not the only ones affected by cigarette smoke. If you are a former smoker, your risk is decreased, but has not gone away completely—you can still get lung cancer. Nonsmokers also can be affected by smoking. Breathing in secondhand smoke puts you are risk for lung cancer or other illnesses. Genetic factors also may play a role in one’s chances of developing lung cancer. A family history of lung cancer may mean you are at a higher risk of getting the disease. If others in your family have or ever had lung cancer, it’s important to mention this to your doctor. Diagnosing lung cancer is different for each person. Your medical team chooses tests based on a number of factors, including your medical history, symptoms and a physical exam. Options may include diagnostic imaging such as X-rays, MRI and CT Scans or tissue sample biopsy. The treatment for lung cancer depends on your lung cancer type, lung cancer stage and lung cancer treatment goals. Options may include surgery, radiation, chemotherapy, targeted therapy, immunotherapy, clinical trials and/or palliative care. Sources: American Cancer Society, Centers for Disease Control and Prevention, American Lung Association and Mayo Clinic. Steve Jobs. Patrick Swayze. Michael Landon. Alan Rickman. These are just a few of the celebrities who have died from pancreatic cancer. November is National Pancreatic Cancer Awareness Month. 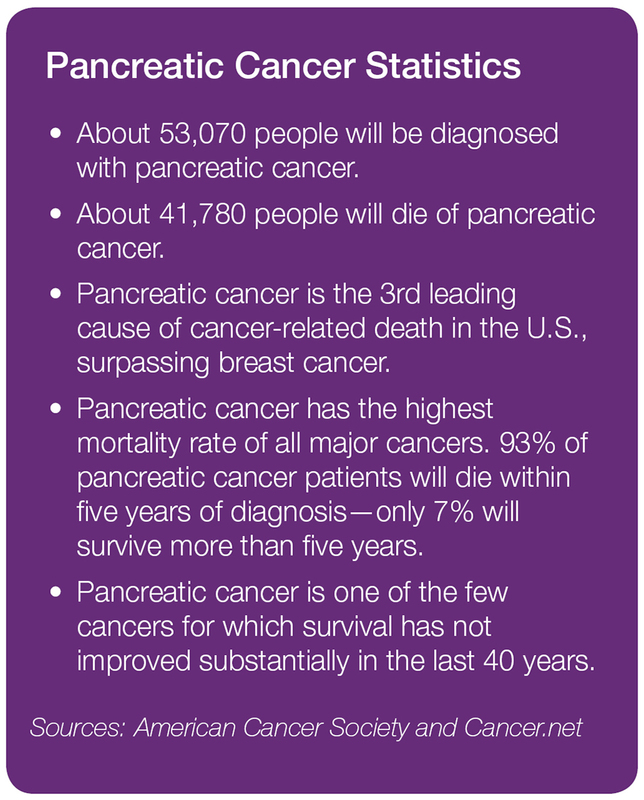 Pancreatic cancer is the deadliest major cancer among all Americans. The five-year survival rate after diagnosis is just 7%. The reason for the low survival rate is because it is hard to detect until it has already spread to other areas of the body. You’ve heard of the pancreas. You probably know it’s important. You know it has something to do with digestion and you maybe even heard talk about it around the topic of diabetes. But what is it and what does it do? The pancreas is a gland located in the abdomen. It is about six inches long and is shaped like a pear. It is surrounded by the stomach, small intestine, liver, spleen and gallbladder. The pancreas is both an exocrine gland and endocrine gland and has two main functions—digestion and blood sugar regulation. Exocrine glands are glands that produce and secrete substances by way of ducts. Examples include the salivary glands and sweat glands. The exocrine cells of the pancreas produce enzymes that help with digestion. When food enters the stomach, exocrine cells release the pancreatic enzymes into the main pancreatic duct. The pancreatic duct carries these enzymes and other secretions, collectively called pancreatic juice. Both the main pancreatic duct and the common bile duct connect with the duodenum, where they aid with the digestion of fats, carbohydrates and proteins. Endocrine glands are glands that produce and secrete substances directly into the blood rather than through a duct. Examples include the thyroid gland, pituitary gland and adrenal glands. The endocrine cells of the pancreas produce hormones, which are substances that control or regulate specific functions in the body. The two main pancreatic hormones are insulin and glucagon. Insulin lowers blood sugar levels while glucagon raises blood sugar levels. Together, these two main hormones work to maintain the proper level of sugar in the blood. As you can imagine, if the pancreas is not functioning properly, it can cause a number of conditions including diabetes or hyper- and hypothyroidism. Pancreatic cancer begins when abnormal cells within the pancreas grow out of control and form a tumor. More than 95% of pancreatic cancers are classified as exocrine tumors. These tumors start in the exocrine cells. Within this category, the vast majority of tumors are adenocarcinomas. The following table describes the different types of pancreatic exocrine tumors. Click here to learn about types of exocrine tumors in the pancreas. Pancreatic neuroendocrine tumors (pancreatic NETs or PNETs) account for less than 5% of all pancreatic tumors. They may be benign or malignant and they tend to grow slower than exocrine tumors. They develop from the abnormal growth of endocrine cells in the pancreas. Steve Jobs was diagnosed with this type of tumor in 2004 and lived for another seven years. The problem with diagnosing pancreatic cancer is that it is hard to find early. The pancreas is deep inside the body, so early tumors can’t be seen or felt by health care providers during routine physical exams. And patients often have no symptoms until the cancer has already spread to other organs. Sometimes when a person has pancreatic cancer, the levels of certain proteins in the blood go up. These proteins, called tumor markers, can be detected with blood tests. But these proteins don’t always go up when a person has pancreatic cancer, and even if they do, the cancer is often already advanced by the time. People with pancreatic cancer may show signs of jaundice—a yellowing of the eyes and skin—as one of their first symptoms. They may also begin to have pain in the abdomen or back. Cancers that start in the body or tail of the pancreas can grow fairly large and start to press on other nearby organs, causing pain. If the cancer blocks the bile duct, bile can build up in the gallbladder, making it larger. Sometimes a doctor can feel an enlarged gallbladder during a physical exam. It can also be seen on imaging tests. Other symptoms include unexplained weight loss, fatigue, loss of appetite and dark urine. Having one or more of the symptoms below does not mean you have pancreatic cancer. In fact, many of these symptoms are more likely to be caused by other conditions. But if you notice something different or have several of these symptoms, it is important to talk to your physician. 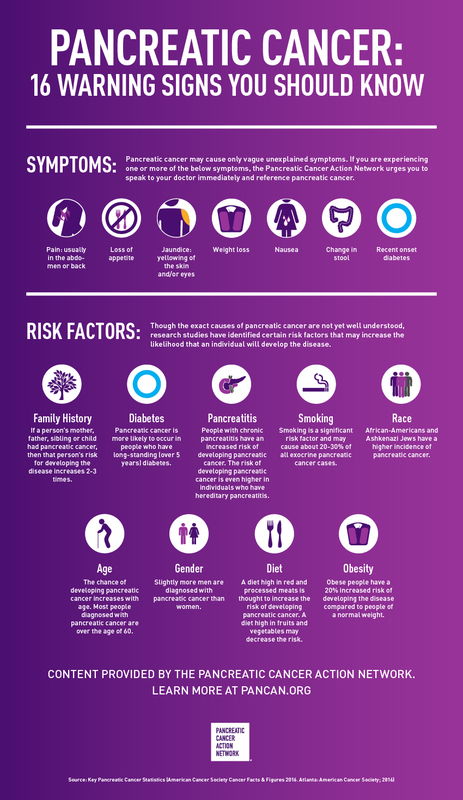 Some people might be at increased risk of pancreatic cancer because of a family history of the disease (or a family history of certain other cancers). Sometimes this increased risk is due to a specific genetic syndrome. Some of the gene changes that increase pancreatic cancer risk can be tested for. Knowing if you are at increased risk can help you and your doctor decide if you should have tests to look for pancreatic cancer early, when it might be easier to treat. But determining whether you might be at increased risk is not simple. The American Cancer Society strongly recommends that anyone thinking about genetic testing talk with a genetic counselor, nurse or doctor qualified to interpret and explain the test results before they proceed with testing. It’s important to understand what the tests can and can’t tell you, and what any results might mean, before deciding to be tested. There is no absolute way to prevent pancreatic cancer. Some risk factors such as family history can’t be controlled. But there are things you can do that might lower your risk. If you are worried about family risk factors or if you have some of the symptoms above, talk to your doctor. There is a very good chance that it is something else entirely. But a professional can look through your medical history and make recommendations as to next steps. The only way to improve survival rates is to promote awareness, healthy living and regular health checkups, and to keep funding research into this disease.